When I just needed to write…. Paula’s Post #29 — Back in September, Joe posted about the loss of his beloved Golden Retriever, Freya. 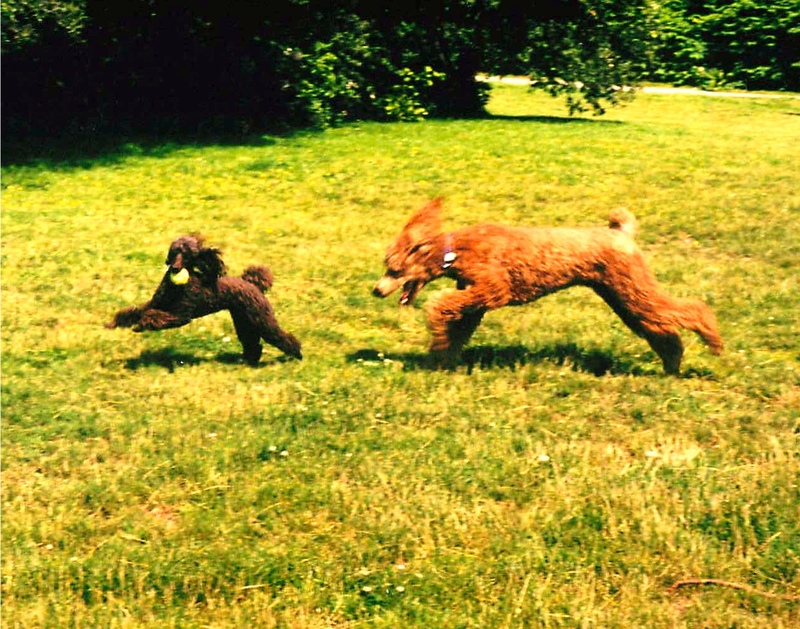 Sadly, this week, ‘life intervened” again and we lost ‘The Contessa’ the seventeen-year-old chocolate Miniature Poodle we inherited five years ago this March from my dear Auntie Sheila. My Auntie Sheila led an exemplary life. She taught me what it means to be kind and generous, to take responsibility for one’s actions and to to look after those who have not had the opportunities that we may have had. Though she had many loves, my Aunt never married. She served overseas as a Lieutenant in WW II as a ‘nursing sister’ in a Canadian Army hospital and later, when she returned to Canada, specialized in the challenges faced by the elderly and the mentally ill, selflessly caring for and nurturing those less fortunate. She also collected Aboriginal Art, loved to garden, threw marvellous parties and enjoyed the occasional gin and tonic. Over the years, whenever there was a need… a crisis… a death… it was always Auntie Sheila who rose to the occasion. I was just 21 when my Mom died quite suddenly from a brain aneurysm when she was just fifty-six, the same age I am now. Even though Sheila’s grief over the loss of her youngest sister must have been immense, my Aunt quietly stepped in to help us. She did the same thing when her sister Jo died and again when my Dad died in 1999. In each case helping to make all the necessary arrangements, easing the burden on those left behind, facing the things that we could not face, including retrieving the ‘cremains’ from the funeral home after the service. Truth is, Sheila acquired a lot of ‘cremains’ over the years: first my Mom, then her older sister Jo, then my Dad. Somehow, she even ended up with ‘Angus’, my red Standard Poodle, who joined the rest of my family on the floor of Auntie Sheila’s closet. By now, I’m sure you’re wondering what this all has to do with the loss of our poor ‘Contessa’. Well, at the age of 80, Auntie Sheila was offered a puppy. Not just any puppy, but the cutest little chocolate drop you ever did see. Happily, that wasn’t the end of the conversation. I knew Sheila wanted this puppy. I knew Sheila deserved this puppy, and so I promised her that if anything happened to her, I would take care of ‘Tessa’. And thus “The Contessa” became the world’s greatest lap dog. She and my Aunt enjoyed sharing cookies (chocolate chip and shortbread), afternoon naps and walking ever so slowly along the seawall. Even after Sheila became so frail she needed to use first a cane, then a walker, Tessie walked patiently at Sheila’s side, always looking up into my Aunt’s face as she waited for Sheila to take another halting step, then taking a a few little prancing poodle steps of her own to catch up, then waiting again until Sheila was ready to move forward. And so it went. Sheila loved Tessie, and Tessie loved Sheila. But Sheila, ever practical, never forgot the looming problem of ‘The Cremains’. (Right about here, you should here a riff of melodramatic organ music). “Surely you must know someone who owns a suitable boat?” she’d say, extending her arm towards my husband to have him refill her drink. Come to think of it, when I look back, I realize the subject of ‘the Cremains’ always seemed to be accompanied by gin and tonics. Sheila like to call John ‘Jeeves’ for his attentive manner and superb gin and tonics. At this point I can hear Sheila’s voice rising as she musters all her persuasive skills. She catches her breath and shifts the snoozing Contessa, clutching her with a wrinkled hand to keep her from sliding off her lap, then reaches for another sip of her drink. “Because if you wait too long, I won’t be here to help,” she reminds us. As always, Sheila was right. She left us on March 5th, 2008 at the age of 92, but not before celebrating her 90th birthday with a smashing party at the Yacht Club and a Greek Islands’ cruise from Athens to Istanbul. Leaning on ‘Jeeves’ arm, our ‘Sheila Valentine’ ascended to inspect the ruins of the Acropolis, visited Topkapi Palace and Hagia Sophia in Istanbul and even stooped to remove her shoes to enter the Blue Mosque. 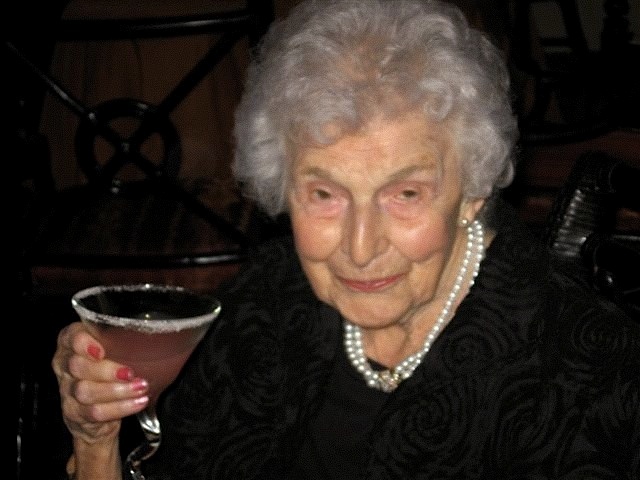 On the Friday before she passed away, Jeeves and I took her out for dinner: a martini, filet mignon and cheesecake for desert. A few days later, ‘The Contessa’ came to live with us. The light bulb clicked on and John remembered the client’s 53 foot boat. On a brilliant sunny day in the summer of 2008, we embarked on Sheila’s last cruise, my brother and his family, John and I and a couple of Sheila’s close friends and care givers… oh, and let’s not forget Sheila, my Mom, my Dad, and my Auntie Jo. Oh, and Angus the poodle, all of ‘the departed’ neatly stacked in small cardboard boxes and loaded into an oversized rubbermaid tub. Yes, you read that right. A rubbermaid tub. Did I forget to mention that my family isn’t really the sentimental type? No one in my family wanted much of a fuss made when they died. When pressed, the most I could get from Auntie Sheila, when I broached the subject of how she would like to be remembered, was an acknowledgement that it might be nice to have “a party” when she was gone (and yes, we had a lovely one). Otherwise, my family was completely unsentimental when it came to such things as ornamental urns and the like, preferring the bare cardboard boxes and utilitarian aluminum cans that more or less come with the cremains. I’m sure the funeral homes are trying to figure out if there’s some way they could deliver the ashes back to the bereaved in something less pricy, ziplock bags for instance, but as far as I know, they haven’t stooped that low yet. But back to the boat cruise. Once out of the harbor, we cruised towards the peaceful waterside locales that had been so special to my family over the years. At Bowen Island, where we’d enjoyed happy summers with my family when we were kids, I opened Mom’s cardboard box and Dad’s aluminum can and we took turns sprinkling the cremains into the sea. Some tears, some words of remembrance, a few scattered flowers, the clinking of glasses (gin and tonics of course) and then it was on to Sandy Cove, the lovely little beach near Sheila’s first house. More flowers, another toast and a sprinkling of Auntie Sheila, a bit of Auntie Jo and then some of my mother, Lorna, the three sisters all together again. Then, since we didn’t want to leave him all alone, we added the last of my Dad’s ashes, too, since he was exceedingly amiable and always got along with the ‘three sisters’. Margaret, Sheila’s Irish caregiver and a staunch Catholic, seemed a bit bewildered by the humble boxes and cans holding the cremains of my family and the rather unorthodox tribute we’d arranged to send them on their way, but Margaret also knew it was what Sheila wanted. She’d heard Sheila discuss the subject often enough. Three times, cardboard boxes were opened. Three times humble, unpretentious containers extracted. Ashes scattered, words of loving remembrance spoken, flowers left to float atop the sea. And then we came to Angus, my big red poodle. Somehow, in the days afterwords, as I grieved over the loss of my beautiful big red dog, I forgot all about the cremains, waiting at the vets. Auntie Sheila, despite her age and frailty, must have taken care of retrieving Angus’ ashes. Perhaps she enlisted the help of her favorite co-conspirator, Margaret. She’d done it before, sneaking off with the aid of Margaret to renew her driver’s license after her 90th birthday, even though by that time she couldn’t really see that well, much less walk. … a beautiful, ornate, pale peach urn. The elegant urn containing the cremains of… the dog. I almost dropped the urn into the sea. For once, words failed me. My brother bent over and snapped a photograph. Jeeve’s eyebrow raised in question and he turned away, fighting to surpress a giggle. Somehow I nodded and said a few words and sprinkled dear Angus and the rest of Auntie Sheila on the waters just offshore from Ambleside dog park, where over the years Angus and The Contessa had spent so many happy days. Then we raised our glasses, toasted Angus’ great heart and spirit, and properly sent him on his way, too, the half melted ice in the bottom of my glass helping to lessen the hot flush of embarrassment on my cheeks. Now, five years have passed. This morning, I sat in the car outside the vets, waiting for my husband John to come back and tell me it was ‘time’, that they were ready for us. He knew I couldn’t bear to sit in the waiting room with “the others”. With those people who would be taking their dogs home again. The Contessa lay cradled in my arms, her head against my chest. I hoped she could smell me and that she was happy. She should be. I’d spoon fed her breakfast in bed this morning and for the past hour had been petting her head and stuffing her greedy little mouth with her favourite dried chicken strips. But it’s hard to tell with ‘The Contessa’, it’s been a long time since she could either see or hear us. Then John appeared at the car door and I felt my throat constrict. “Not yet,” he said, his voice gentle. John knew how hard this was going to be for me. I saw it in the bright sparkle of unshed tears in his eyes as he leaned down to speak to me, one hand outstretched to touch Tessie’s head. John knew it was the end of a journey, not just for Tessie, but for me and for the promise I’d made to Auntie Sheila. The promise to look after her puppy. The promise John helped me to fulfill, even though he hadn’t even been married to me when I made that promise. But of course, she was John’s Auntie Sheila, too, and he never complained about traipsing outside in his robe in the rain in the wee hours after ‘The Contessa’ could no longer make it through the night. I gripped Tessie tighter. Even as I said it, I knew it was ridiculous! I mean, we’re thinking of putting our house on the market later this spring and honestly, I’ve got enough stuff on the floor of my closet. And like I said, we’re not sentimental at all. I have a feeling we’ll be ordering gin and tonics tonight and maybe, just maybe, we’ll try to figure out who owns a suitable boat. Sometimes, ‘writing’ is more important than just writing. A poignant story, beautifully told Paula. Farewell, valiant little Tessie. She really was royalty. Lovely to remember dear Auntie Sheila at the end of Tessie’s journey. Both were very special ladies. I still remember Sheila’s many stories she told me when I brought her dinner on Wednesdays during her last year. Both she and Tessie will always have a special place in my heart. I’m so glad I saw Helga’s link and stopped here to read this. I’m happy to know the special bond between you, your family and the dogs was treasured right to the end. Your Aunt Sheila sounds like a beautiful person. I’ve owned, bred, trained and exhibited many Shelties over the years and most of their cremains were “planted” in our gardens. Our previous Lab’s cremains reside in the woods behind our house where she always loved to romp. A little stone with a heart engraved on it marks the spot. So much love and devotion is received from our dogs. I can’t imagine our commitment to them not including a loving farewell. I never quite “get” people for whom a dog is little more than a possession. Thanks for sharing your story Paula. Good-byes are one of the hardest things to do. 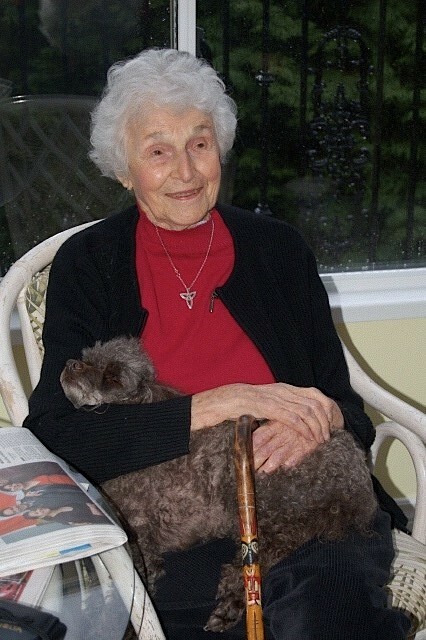 Longevity has blessed your family and precious pets and given you many good memories.